This was our third time returning to the Johnny Keenan Banjo Festival, and each time has been more fun than the last. 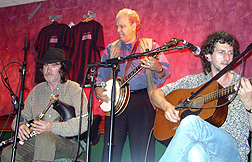 The unique aspect of this festival is the mixture of Irish music (featuring flatpicked 4-string tenor banjo) with American 5-string banjo music in some of its many forms, including both 3-finger bluegrass style and clawhammer. 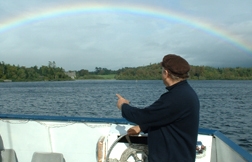 This year the coordinators, Chris Keenan (Johnnys widow) and Kathy Casey took a large and daring step: bringing Earl Scruggs himself to the shores of Ireland for the first time ever. Earl put in a TV appearance in Dublin and was the featured closing act for the big Saturday night show in a huge rented tent (they call it a marquee there). Chris and Kathys gamble paid off, with by far the most attendance yet at the three-year old event. When Earl Scruggs makes his first European appearance at the age of 80, you can be sure that many banjo fans from all over will make a point to be there. One way I experienced this first hand was at the intermediate/advanced banjo workshop I taught. Of about 20 players, seven countries were represented: Ireland, England and Wales of course, but also Scotland, France, Spain, and the Czech Republic. And then there was I, an American. Im virtually certain Ive never been in a room of banjo players with that many different nationalities represented. And Im sure many other countries were represented at the festival as well.
. Joan Wernick created many highlights. 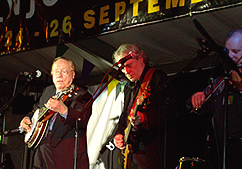 And Earls group, loaded with Nashville super-pickers, also featured fine singing from Jon Randall, John Jorgenson, Gary Scruggs, and Hoot Hester, were the only band at the festival to follow the basic bluegrass instrumentation and format. In attending each of these festivals, my appreciation of Irish traditional music has expanded greatly. It is so fully entwined with the Irish culture itself, enlivening nightlife in the pubs, and passed down through the generations in families and communities. TV and popular culture dont run this country to the extent thats true in America. The regular people make this music and know it deeply. The talents of even "local average musicians" are really impressive. One big highlight for me was a sort of "workshop" session where I was teamed with Gerry OConnor. Gerry is considered Irelands leading banjo, or one of them anyway. Hes a very lively and yet low-key guy, with an appealing personality and a really great attitude about music. And boy, can he move that pick! Gerry gets a high-definition sound that dances all over the neck with grace and spirit that seems to come right from his heart. For all I know this might have been a first, a full hour of a Scruggs-style player and an Irish flatpicker finding common ground. We had no plan, just started picking tunes and playing them. We started with You Are My Sunshine, just to warm up, then Old Joe Clark, and before long we did Blackberry Blossom, Mountain Dew, Soldiers Joy, Foggy Mt. 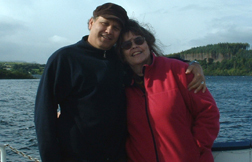 Special, a long jam on Sally Goodin, and yes, Foggy Mt. Breakdown (started slow, with call and response, kind of like Dueling Banjos, which I generally boycott, then finally the long-awaited speedup). You can see by the tune selection that Gerry was meeting me more than halfway, playing mostly American based material, and improvising his way through all the challenges. Among his impressive techniques, including the ever-ready triplets, is a really fast crosspicking "roll" done on three adjacent strings with a flatpick, similar to what Jesse McReynolds does on mandolin. We got some very cool combinations going, and the hour flew by quickly. What a blast! Paddy Keenan, Tommy O'Sullivan and the Flexigrass' Bill Pontarelli. Pete joins in. Note Paddy's Ullian pipes, of which he is the master. A little while later, inspired by the music (not to mention a bit of Guinness), and the fact that they were playing a tune I actually knew, I came up on stage with my banjo and finished the tune with them. They welcomed me and we shared mics. This felt like something of a breakthrough for me, as I have been truly intimidated by the Irish players musicianship, and was just getting used to the fact that good musicians would rather find a way to connect than just stay within their own worlds. 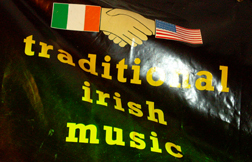 Part of the shyness between the Irish and American musicians seems to be based on mutual respect and mutual unfamiliarity with each others repertoire or instrumental techniques. But another part of the gulf between Irish music and American bluegrass is possibly due to technical presentation factors. Virtually all the Irish musicians plug in their instruments and virtually none of the Americans do. A glaring case in point occurred during the Friday night set of the super-picker trio of Tony Trischka, Casey Driessen, and David Grier. The set started off with the musicians clearly having trouble with the sound they were hearing through their stage monitors, and also being often close to inaudible during some of their best musical fireworks. Though Im normally quite reluctant to disturb working festival sound technicians, I wasnt about to let some of Americas best go unheard in this rare opportunity to play in Ireland. I approached the soundman and explained that I was performing on the festival and was familiar with these musicians, and that they were used to being mixed differently. He responded contemptuously, "They dont even plug in their instruments!" I took a deep breath and let him know that my band and that of Earl Scruggs would be performing the next day, and that most of the instruments would be unplugged. He made no apology but agreed to let me direct his mixing for the rest of the set. Almost immediately, the audience began applauding after David Griers solos. I mentioned that David had won Guitar Player of the Year twice. The soundman later told me, "Stick around for the next set and youll hear a real guitar player. Aggghhh! What can you say to that? I decided to complain directly to the festival presenters and the head of the sound company. The next day, I talked to the sound people setting up for Flexigrass and Scruggs band. I told them how the previous nights sound mixer had behaved so badly, he should be reported to the head of the sound company. Their response: "He is the head of the sound company." Egad! Fortunately, that day, he was absent, apparently to work a more important gig. It turned out that that days sound was just fine. Its not the easiest thing performing directly before a living legend makes a rare appearance. Flexigrass played our best and the audience treated us very well, but it was clear thered be no chance for an encore with Earl and his band waiting in the wings. Sure enough, when they came out, the audience rose to its feet for a powerful ovation. A veteran Irish music observer said hed never before seen a standing ovation before a set of music. Earl smiled his typical shy smile and launched into a first-class set of top bluegrass favorites. He was in fine form, powering through Earls Breakdown, Doin My Time, Sitting on Top of the World, and of course, Foggy Mt. Breakdown. This group is clearly one of the best Earl has assembled in recent times. On Foggy Mt. Special, John Jorgenson put down his mandolin, and picked up a clarinet for a well-played solo. Quite a surprise! (Has Flexigrass started something??) There was no doubt by the end of the set that the Irish and international audience had received the rare treat they had come so far for and waited so long for. Later, Earl told me this was the first time he had ever played in Europe. You have to hand it to a guy who is still breaking new ground at the age of 80. Following the concert, I got together with Earls fiddler, Hoot Hester, in the crowded bar at the hotel where we stayed. Irish pubs typically close sometime around midnight, and then commence to party down with beer-driven exuberance well into the wee hours. Musicians are routinely let in, contributing to a high level of sound and general mayhem, while the beer, etc. never stops flowing. Hoot and I stood close together and ran through a large gamut of fiddle/banjo tunes, facing each other and going from one to the next. That is a rare treat for ol Pete, and Hoot told me that he doesnt get much chance to do that either. Along came a rather drunk guy, playing guitar. He tried to keep up, but it didnt go well. Hoot graciously asked him what hed like to play, and the guy obliged with a nice enough song that we accompanied him on. Then he left, thank goodness, and Hoot and I got back to fiddle tunes. The next day, Earl and Louise were taken for a drive through the Irish countryside by our favorite taxi driver, Martin Sinclair. Martin listens avidly to all sorts of music, and was quite honored to give the Scruggses a tour. He later commented that Earl had expressed special interest in the farming methods he saw. Reminds me of the old saw about how you "cant take the country out of the boy." Later that afternoon, the Nashville entourage started the long trek home, a surprisingly short stay for a first visit, but one leaving Im sure a considerable impression on the music fans on the east side of the Atlantic. Sundays doings at the Johnny Keenan Festival start with a memorial to Johnny at the cemetery where hes buried, just outside Longford. Its a high and windy spot overlooking beautiful green hills. Johnnys mother and family are there, as well as many friends. Paddy Keenan brings out everyones feeling of loss with his understated, wistful whistle. Johnnys grave is decorated with respect and joy for his life, and the group feels satisfied and closer as they get back into cars and head down the hill for more music. My Sunday included the "international" banjo workshop referred to above. As usual, so many of the players are mostly in need of the opportunity to play bluegrass with other musicians. Its understandable that they dont have many opportunities in Europe, though I have always found there are more available bluegrass musicians than everyone seems to think, because so many of them are closet players, and how would any closet player know about another closet player living five houses down? They all think theyre the only one around. I let the assembled players know this truism, and then did what I could to help them sound like "real" Scruggs-style players. The Sunday night show by Flexigrass was more extended and relaxed than the previous nights preceding Scruggs. The show was in a smaller venue, the hotel ballroom, and as the festival was winding down, a comfortable camaraderie of those assembled was a great context for our band. Its not typical for the festival to repeat headline groups one year to the next, but our band had been given that honor. Again, we gave it our best, and enjoyed a very warm reception. Perhaps the most poignant part for me of this years Johnny Keenan Festival was a chance to knock back a few and talk at length with two of my favorite Irish musicians, Gerry OConnor and Cathal Hayden, in the wee hours following the festival and before our departure. Cathal is a wonderful fiddler and banjo player, an original member of my favorite Irish group, Four Men and a Dog. He gets an amazing sound out of his banjo, tuned a fifth lower than the standard Irish tenor tuning, one that can really stir the heart and make you love the banjo in a whole new way. We worked on my pronunciation of Cathals name, till both he and Gerry were satisfied that I had it perfect. The first vowel sound is like the o in "hot", the t has just a suggestion of "th", and is immediately followed (no vowel) by the l. Strange to say, we all got considerable satisfaction from me, an American, mastering anything unmistakably Irish. We went on to discuss the previously mentioned gaps between Irish and American musicians, and Gerry and Cathal gladly wrote down recommendations for listening. I must say, Irish music seems like a very large and deep world to become acquainted with, and it seems like the most plausible way to learn it is just to be around it a lot and let it sink in. Of course, thats what they, the Irish musicians, have done, and its what they recommend. Following the festival, I resolved to learn Irish music well enough to play it, even if only a small step at a time. With some of the festival musicians music playing on my headphones traveling across the Atlantic, and in my car once back in Colorado, my resolve increased. I consider it a great blessing that Chris and Kathy, who present this wonderful festival, think of Joan and me as having a "lifetime" invite to perform. When the opportunity to perform with Earl Scruggs and Steve Martin at the New Yorker Festival in September 2005 came up, I was both excited and dismayed, as it conflicted with the Johnny Keenan event. With a certain reluctance I contacted Chris, who assured me they fully understood, and encouraged me to take the New York event. "Well just look forward to having you next year," she said. I had truly looked forward to being able to say with each passing year, "Yes, Ive been at every one." That wont happen, but Im confident that my connection to Ireland and her magical music will continue to grow.